# 136 - This banjo is the Big Daddy of the current group. It has a very large 14 1/2" wide gourd that's about 7 1/2" deep. The mahogany neck has a scroll style peghead, figured maple fingerboard, and a rear grasp 5th string peg. 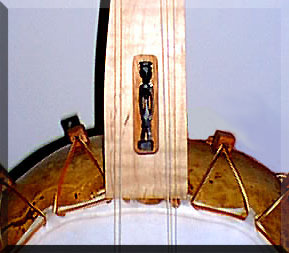 A distinctive feature of this banjo is the carved African man inset into the upper portion of the fingerboard. (see close-up above) There's no other decoration on the banjo at this time.  Bead tighteners attach the first quality calfskin head. Hope no one buys this one.